As you made a google search… sure you would have been impressed by the picture of our ancestor…..
Not many of us would have been aware of the ‘…… Gorilla Fund International (originally the Digit Fund)’ - a charity for the protection of endangered mountain gorillas. The Fund was created in 1978 for the sole purpose of financing anti-poaching patrols and preventing further poaching of the mountain gorillas. The non-profit fund was named in memory of gorilla, Digit, who was decapitated by poachers for the offer of US$20 by a Hutu merchant who specialized in selling gorilla heads as trophies and gorilla hands as ashtrays to tourists. Among other things, Dian Fossey strongly opposed tourism, as according to her research, gorillas are very susceptible to diseases by humans like the flu for which they have no immunity. Dian Fossey reported several cases in which gorillas died because of diseases spread by tourists. She also viewed tourism as an interference into their natural wild behaviour. Today, however, the Dian Fossey Gorilla Fund International recognizes the importance of tourism in helping to create a stable and sustainable local community dedicated to protecting the gorillas and their habitat. Sometime during the day on New Year's Eve 1977, Fossey's favourite gorilla, Digit, was killed by poachers. As the sentry of study group 4, he defended the group against six poachers and their dogs, who ran across the gorilla study group while checking antelope traplines. Digit took five spear wounds in ferocious self-defence and managed to kill one of the poachers' dogs, allowing the other 13 members of his group to escape. Poachers sell gorilla hands as delicacies, magic charms or to make ash trays. Digit was decapitated, and his hands cut off for ashtrays, for the price of $20. After his mutilated body was discovered by research assistant Ian Redmond, Fossey's group captured one of the killers. He revealed the names of his five accomplices, three of whom were later imprisoned. Fossey subsequently created the Digit Fund to raise money for anti-poaching patrols. The deaths of some of her most studied gorillas caused Fossey to devote more of her attention to preventing poaching and less on scientific publishing and research. 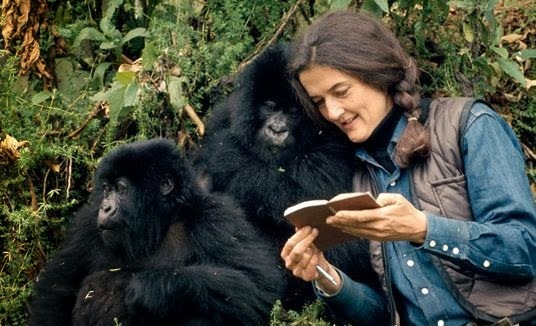 Fossey became more intense in protecting the gorillas and began to employ more direct tactics: she and her staff cut animal traps almost as soon as they were set; frightened, captured and humiliated the poachers; held their cattle for ransom; burned their hunting camps and even mats from their houses. Fossey also constantly challenged the local officials to enforce the law and assist her. Just as an additional info : ‘Google doodles’ – are the Google logo on search page which many a times are animated expressions. Google puts special doodles marking special occasions and days. Google doodles on homepage of the search engine has made it more fun and enjoyable for the users and nobody ever anticipated that it would become so popular. Nowadays, many users excitedly anticipate the release of each new doodle and some even collect them! Having a little bit of fun with the corporate logo by redesigning it from time to time is unheard of at many companies but at Google, it is a part of the brand.